Get into the holiday spirit with our new Red Wood & Metal Holiday Sleigh! It will have you singing Christmas Carols all the way through New Year’s! 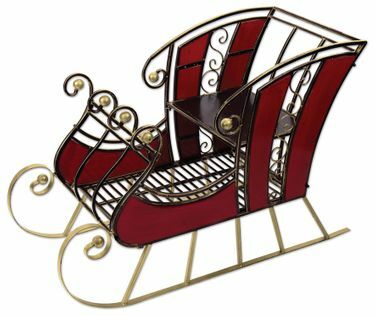 This beautifully decorative Christmas Sleigh is a festive red and features gold, spiraling runners and smooth lines on the sides. And, you can put it together in minutes with easy assembly so it's ready to enjoy all Winter long! This 38" Red Sleigh is perfect for Christmas festivities, both indoors or out. Use alone, string with twinkling Christmas lights or lovely silver bells, and fill it up with gifts to bring more joy to your home or office. Your friends and family will love the memories it brings. Not for rides, decorative use only. Size: 37.75"L x 24"W x 16"H., Metal & Wood.